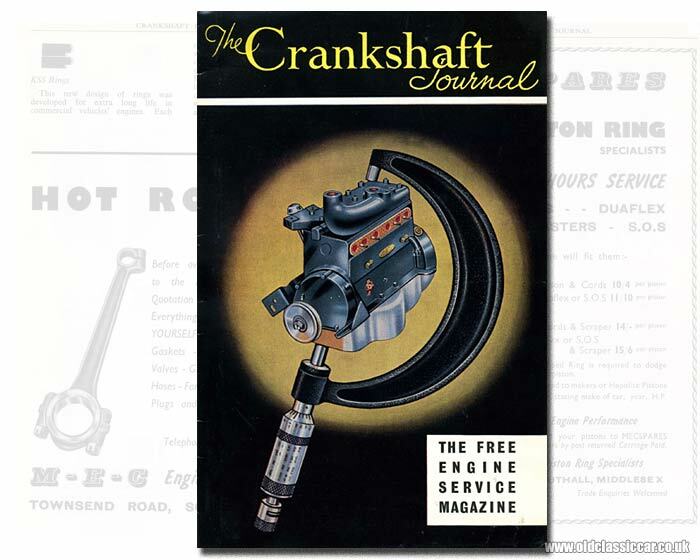 The Crankshaft Journal magazine for engine re-conditioners in the 1950s. Homepage. This page: Volume 2 Number 2 of The Crankshaft Journal magazine, written for engine re-conditioners and machinists. The Crankshaft Journal engine re-conditioning magazine of the 1950s. If there was an award for the most obscure motoring magazine, this would surely be in the running. The Crankshaft Journal was a trade magazine published by the M.E.C. (Mascot Engineering Company) Engineering Group, and targeted individuals and businesses involved with the world of engine re-conditioning and car maintenance. 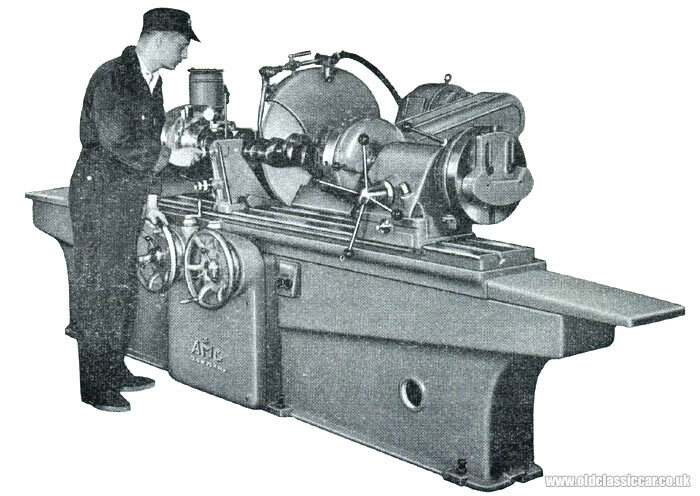 This issue dates to September 1959 and features on its cover an illustration of a four-cylinder sidevalve car engine, and an oversized micrometer. Mascot Engineering Company, Southall, Middlesex. The magazine was produced by the Mascot Engineering Company, or MEC, from their offices at Mascot House, 1-3 Townsend Road, Southall in Middlesex, from which future copies of The Crankshaft Journal could be requested. Evidently MEC was a large player in the world of engine re-conditioning, and also in the supply of related engine parts. Several departments were located at their Townsend Road address, while MECSPARES, which specialised in the supply of pistons and piston rings from manufacturers such as Cords, Hepolite, Duaflex, Oilmasters and SOS, operated from premises at 189 The Broadway, Southall (now home to a restaurant). Austin 8 sidevalve 1939 - 1946 £31 15s 0d. Austin 10 sidevalve 1932 - 1947 £35 15s 0d. Austin A30 OHV £32 15s 0d. Austin A35 OHV £35 15s 0d. Austin A40 OHV £37 15s 0d. Ford 8 1937- (metalled rods) £26 15s 0d. Ford 10 1937- (metalled rods) £26 15s 0d. Ford Consul Mk2 £47 10s 0d. Hillman 10 1935 - 1936 £35 15s 0d. Hillman 10 1937 - 1948 £35 15s 0d. Morris 8 Series 1 and 2 sidevalve £31 15s 0d. Morris 8 Series E, Z van, MM sidevalve £31 15s 0d. Morris 8 OHV (BMC) £32 15s 0d. Morris 10 Series 2 £36 15s 0d. Morris 10 Series M OHV £39 15s 0d. Morris 12 Series 2 and Commercial £39 15s 0d. Morris Oxford & J Type van £42 15s 0d. Morris 1000 £35 15s 0d. Standard Flying 8 1936 - 1946 £31 15s 0d. Standard Flying 9 1937 - 1940 £34 15s 0d. Standard Flying 10 1937 - 1940 £36 15s 0d. If your old engine though had serious issues, there would be surcharges applied - for instance, a cracked block would incur an additional fee of at least £15, while a damaged crank would add a further £5 5s 0d at least to the bill. Many garages though preferred to overhaul an engine themselves, only sub-contracting out specific machine work that they couldn't handle themselves. MEC were happy to supply re-conditioned crankshafts on an exchange basis, which came with Vandervell bearings as standard. Prices tended to range from £3 10s 8d for cranks suitable for use in Ford 8s and 10s, up to £4 16s 0d for a crank destined to fit a Morris 8, and £5 15s 6d for a Flying Standard 9/10 item. The MEC machine shop in Southall was a well-equipped affair. They were proud to announce in this issue that they'd recently received delivery of two brand new crankshaft grinding machines, each capable of machining a crank upto 5 feet in length. Individual machining prices would be quoted for as required, typically the re-boring of a cylinder measuring upto 3" in diameter would have cost 8s 9d, while line boring a unit with four main bearings would have cost £15 0s 0d. Articles within the magazine discuss different aspects of engine overhaul, and are written with both trade and keen DIY-ers in mind. The Editorial confirms that they are just as keen to help out the private motorist with the overhaul of their motor-car's engine, in a bid to keep non-essential expenditure to a minimum, as they are to support trade re-conditioners. They stress though that saving money has to be countered with ensuring that the rebuilt engine is going to be reliable, and that shortcuts aren't taken. For instance, MEC point out that it is a false economy to fit new bearings to a crankshaft that had already powered a car for 30,000 miles, and that in the medium to long term, re-grinding the crank before installing new bearings made a lot more sense overall. The first two articles are in fact extracts from Hepolite's own service manual, and discuss piston rings, types of ring (eg taper sided, spring backed, Hepoflex and oil rings etc), their design, and how they should be installed on to a piston. Emphasis is placed on ensuring that no connecting rod is bent. If one is found to be out of true, tips on how one might be straightened in a conventional vice are given. Instructions and illustrations also describe how a ridge reamer works, essential if you had a significant wear ridge at the top of any cylinder bore. Further into the magazine, advice is given regarding the automobile's cooling system, and how it should be regularly flushed out to ward off occurrences of overheating. A separate piece takes a close look at Variflo adjustable shock absorbers, something obtainable from Mascot Engineering should Sir or Madam wish to upgrade their car's suspension parts. No special tools were required to alter each unit's settings, a click adjuster making it straightforward to balance the damping action at each corner of the car. No prices are given for this useful upgrade, although they "... cost very little more than pre-set [OEM] shock absorbers..." we're told. Clearly, anyone planning on rebuilding either their own car's engine, or the power unit installed in a customer's car, would have found this small magazine to be of great interest, and the services and products offered by MEC to be worthy of consideration. How many issues of this magazine that were produced I don't know, I've not seen another copy and cannot find many references to this company at that time, the late 1950s. 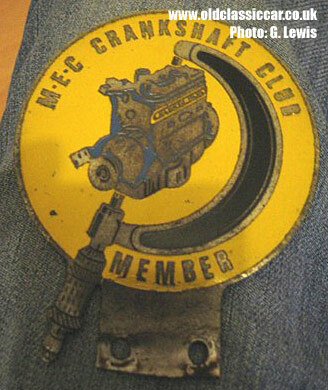 The Mascot Engineering Company Crankshaft Club. "My Father used to use Mascots Engineering based in Southall. We used to live at Hayes, just down the Uxbridge Road. I was sorting through the old odds and sods in my garage recently and came across a badge from the Hayes Show where my 1938 Morris 12/4 Series III was exhibited, an old chrome & yellow AA badge, an Uxbridge Veteran & Vintage club badge of which I was a member and, finally, a badge from the Crankshaft Club which is the same as shown on the front page of the article about Mascots. All the aforementioned badges are the type that was affixed to a suitable badge bar of that period. I thought it may be of some interest to you." Thanks for sending the photo over George. Does anyone else remember this club? Return to the car magazines section for information on similar motoring magazines.